It’s red season around here. If you’re from Kansas City, or anywhere in the general vicinity, you know exactly what I mean! Not sure what I’m talking about? Keep reading, because I’m excited to have partnered with Farmland Foods to share what this is all about. While our city may be divided into many different counties, scattered across two different states… there will forever be one thing that unites us all. Whether you actually enjoy or have any interest whatsoever in the sport itself is completely irrelevant. That’s because here, football isn’t just a sport. It’s a way of life! It’s about uniting with your community. It’s about going outside your home on game day, and seeing the entire city painted red with chief gear. And, most importantly for some (self included), it’s about the food! 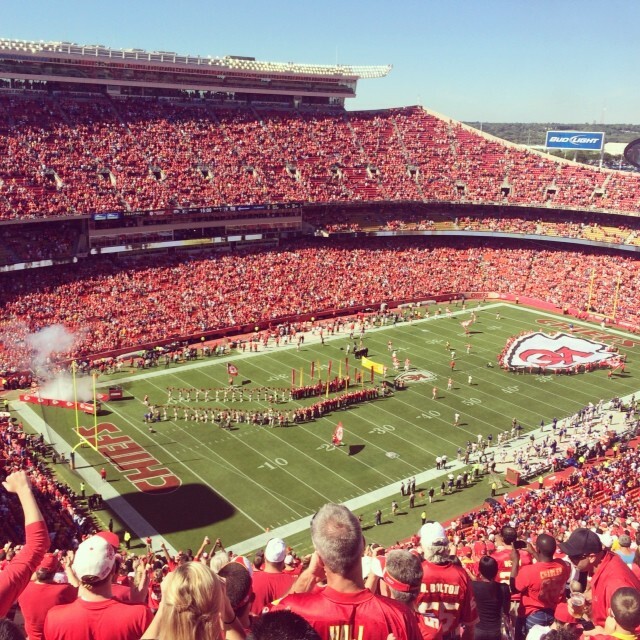 Kansas City is already all about BBQ, so tailgating on game day is just another excuse to do just that! Whether you’re tailgating in the parking lot of Arrowhead Stadium, or throwing some things on the grill with your close friends and family… it’s a must that you bring some creative and tasty items to the table! I’ve been browsing the Farmland Bacon Club for a few new ideas for this year. You can never go wrong with bacon! 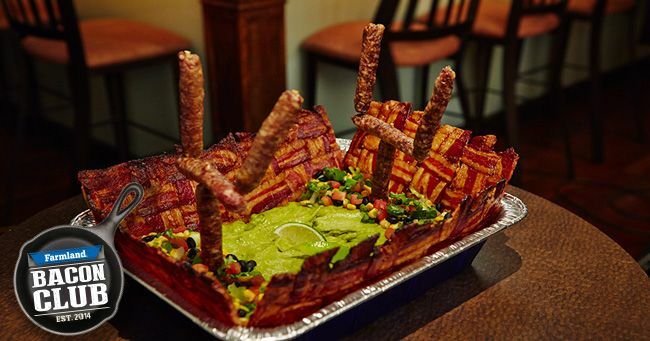 The Bacon Football Stadium – This is made by weaving bacon and cutting it into grandstands inside of a tin pan. The field is made of guacamole, and the end-zones consist of black beans, roasted corn and salsa. Use a few Farmland Sausage Links for goalpost and you’re good to go! The Farmland Bacon Club site give you full instructions along with details to execute it perfectly! Chicken Fried Bacon – Don’t be deceived… this recipe contains no chicken at all! 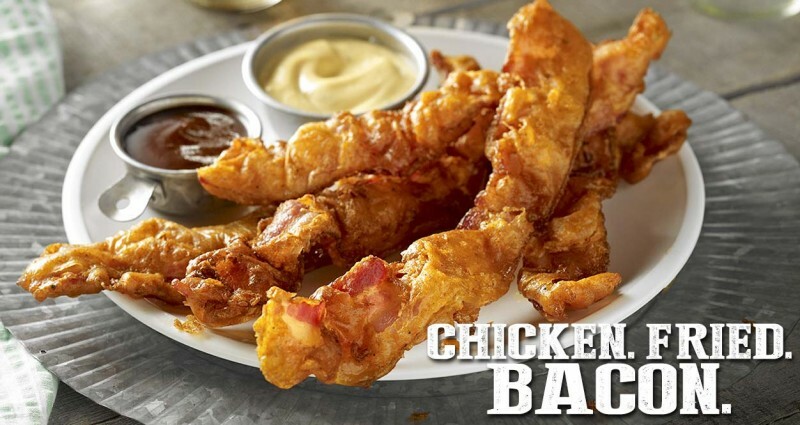 Instead, its 15 strips of perfectly battered, southern pan fried… BACON! I can’t wait to try these! Sound right up your alley? You’re in luck! 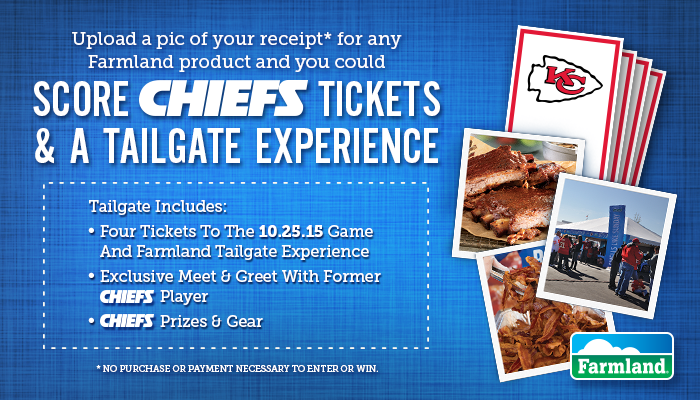 Farmland is treating one lucky fan to a one-of-a kind tailgate with the “Red Hot Chiefs Tailgate Experience” Sweepstakes! Now through September 28 you can enter the “Red Hot Chiefs Tailgate Experience” Sweepstakes by purchasing at least one Farmland product and texting “Chiefs” to 811811 to receive a link to the sweepstakes entry form. Simply click the link and follow the directions to submit your entry with an upload of your original receipt. -Winner will be randomly selected October 6, 2015. Limit one per person per day. The more entries you submit, the better your chances to win! Inspired by the bacon recipes! Sign up for the Farmland Bacon Club for more, as well as giveaways and bacon-related tailgating videos! Thank you to Farmland for sponsoring today’s conversation! Perfect Size for 1 Cake Mix, Mug and About 1 Minute – Quick Warm Treat!